* Enter any other details, or date needed. This listing is for one clutch. 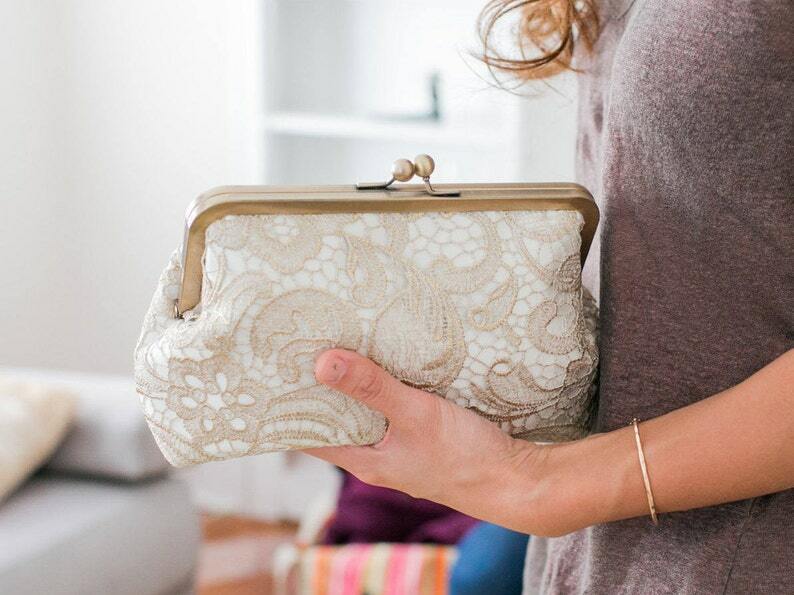 This gold lace clutch is stunning! 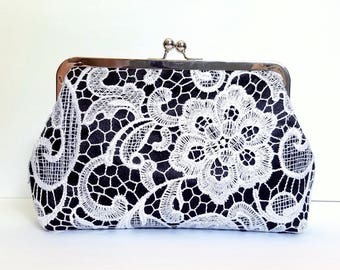 Imagine a perfect purse for your big event, and this is it! Treat yourself to this gorgeous gold bridal clutch! Or give it as a gift for the mother of the bride! 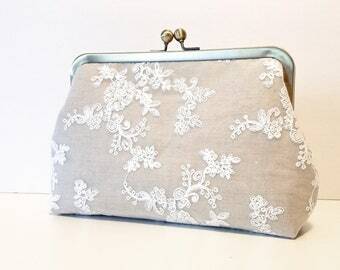 Perfect for your bridal clutch, wedding party or a special gift for your maid of honor! The beautiful lace overlay is flecked with gold and features a swirling floral design. 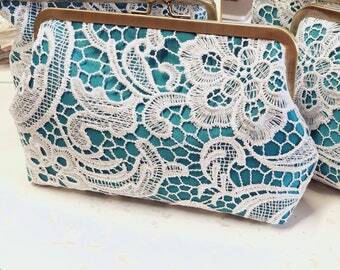 It is made by hand so and every purse has slightly different placement of lace. The clutch is made of beautiful gold leafed embroidered lace over off-white satin fabric. This listing is shown with gold champagne satin inner lining. Also, I am happy to make this clutch in the color of you choice! Contact me about custom clutch orders, discounts on multiples and custom shipping charges for sets. Want this clutch in blue? Great quality,answered all of my questions promptly, and got the clutch way sooner than expected. Highly recommend! Beautiful and intricate! Can't wait to give to my bridesmaids! I accept payment through with direct checkout OR PayPal, which is a secure online payment system that is easy to use. You don't need an account to use PayPal. Simply follow the link to pay by credit card. Please submit payment within 24 hours. If payment is not received within this time frame, I reserve the right to cancel the transaction. I ship to the shipping address you provided during checkout. If you would like the package shipped elsewhere, please let me know. If you are unhappy with your purchase, please contact me first and let me know what the problem is before leaving a feedback, I will do my best to resolve it to your satisfaction. I must be contacted within 48 hours of receipt of merchandise to arrange for a return or exchange. Refunds (minus shipping) will be made via PayPal once I have received the item in unused condition and in its original packaging. To return, you must add delivery confirmation to ship if in the U.S. You must return it within 14 days of purchase for a refund, minus shipping charges. Please notify me before returning any items, all returns must be authorized. CUSTOM ORDERS WITH PERSONALIZED LABELS CANNOT BE RETURNED. All items will be shipped after payment is cleared in the time frame indicated in each listing. Items come in gift boxes and/or packaged carefully in a bubble mailer to ensure protection. Tracking will be provided for USA addresses. Insurance is not mandatory, but recommended, please send me a note if you require it. International Customers: Items will be shipped USPS First-Class International. This generally takes 6-20 days for international residents. However, it might take longer if your package is held up in customs. PLEASE NOTE: I AM NOT RESPONSIBLE FOR YOUR COUNTRY'S TARRIFS, TAXES, AND DUTIES. The UK is especially diligent about collecting taxes! You may have to collect your package at the Post after paying tariffs and taxes. Please note that I cannot mark the package as a gift. Sometimes, packages take longer than the above times to arrive. Please contact me with any questions you may have. I'm sorry, but I can not be responsible for damages or lost items caused by the Post Office. Contact me if you would like a custom order! I love new ideas and designs! Previous sold orders may also be available. First, check to make sure it is not already included in the price, or has a drop-down menu option to add it already. Shipping varies depending on quantity of clutches and current production time. To see estimated shipping times, find the "Shipping & Policies" tab under the photos, next to the item details and reviews. Feel free to contact me if you need rush shipping or want a place a custom order. Purses on an 8" frame are approximately 9-10" (24 cm) wide, 6" (15 cm) tall, and 2.5" (6.3 cm) deep. Purses on a 7" frame are approximately 8-9" (23 cm) wide, 5" ( 14 cm) tall, and 2.5" (6.3 cm) deep. I love custom order! 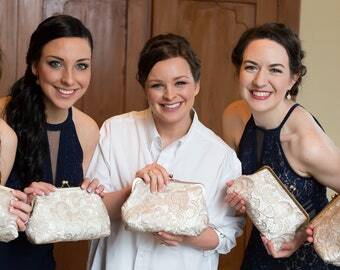 If you have extra fabric from your dress, or a vintage dress you want to turn into a purse, contact me for a quote! Contact me if you have questions about custom colors- I will do my best to find a match!